This page contains a collection of resources related to starting, owning, and running an ATV dealership. There are many resources and you may want to bookmark this page so that you can return anytime to use the resources available. 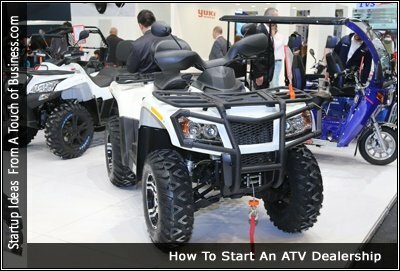 This section contains articles that will give you an overview of what’s involved in starting your own ATV dealership. Have a look at the articles that catch your interests. If I were thinking of starting this type of business I would look at each of them. The section contains the variety resources related to running an ATV business, each section has a heading followed by relevant articles and resources. Below you’ll find a collection of articles that I found interesting about ATVs you can learn many insights about this type of business by going over the information experienced people are putting out there. This section will give you an overview of the profitability and revenue that you can expect from owning an ATV dealership. Keep in mind there are many issues that come into play when it comes to revenue and profitability. For example, how you market your business, the location of your business, the products and services you offer, the market demand in your area, etc. The resources below offer an industry overview. Marketing is an important part of any business, the better your marketing is, the more revenue you can expect out of your business. That doesn’t mean just because you market something that’s it’s going to work, you have to have the right products and services for the right customers.